← A short but cool update. 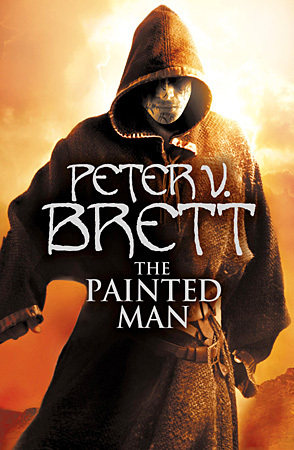 September will see the release of The Painted Man, Book One of the Demon Trilogy, introducing author Peter V Brett onto the fantasy scene and cementing (in my opinion) his place in the genre. Peter has graciously agreed to an interview through email. First off, thanks for agreeing to the interview, Peter, and welcome to the South African fantasy-reading public! Thanks, Dave. I’m still trying to wrap my head around people reading my work half a world away, but it’s an amazing feeling. I hope the rest of the SA fantasy community enjoys the book as much as you did. I appreciate the chance and forum to talk to South Africans about the books, so thank you for the opportunity. Well, I’m 35, live in Brooklyn, New York, and am a new father. Really new. So new I still have an impression on skin from the hospital wristband. Most of this interview was typed in the middle of the night between feedings. I have a degree in English Literature and Art History from the State University of New York at Buffalo, and worked in pharmaceutical publishing for 10 years before escaping the cubicle farm to write. The Painted Man will be my first published novel. What was the first fantasy novel you ever read, and do you have any authors that you keep an eye on? The first non-school book without pictures that I ever read was JRR Tolkien’s The Hobbit. I must have read that book a hundred times, and it’s probably why I have such a close affinity to the fantasy genre. I’ve never wanted to write anything else. I like a lot of authors. Favourites include George RR Martin, Terry Brooks, RA Salvatore, Robert Jordan, CS Friedman, Naomi Novik, and Philip Pullman, but there are plenty of others. I was taking a fantasy writing class at New York University in 1999, and we had an assignment to write the first chapter of a new fantasy novel. Tired of seeing the same themes over and over in fantasy, I wrote a little story about a boy named Arlen who loved to wander, but was never allowed to walk more than half a day from home, because as night fell, demons rose from the ground, and only the protective symbols on his home could hold them at bay. I wrote the story in one night, handed it in, and went back to the other novel I was working on, but more and more, my thoughts drifted back to Arlen and his world, until I could think of little else. I picked the story back up a couple of years later, determined to help Arlen find out what was over that next hill. I admit, I wanted to know as much as he did. You’ve created a vibrant and beautiful world that could perhaps be seen as an alternate future-history of mankind – how did you approach the worldbuilding process? Years of playing Dungeons and Dragons (See mom? It wasn’t a waste of time, after all!) trained me pretty well at worldbuilding. My goal was to create a world that was comfortably familiar to the reader, while avoiding most of the standard fantasy tropes, such as swords, wizards, elves, and young peasant boys who suddenly discover they are descended from kings. Not that there’s anything wrong with those things, but I wanted to try something different. I will say, though, that what truly makes a world come alive is not the places you create, but the people you fill them with. Many of the characters you’ve created have names that, when read out loud, sound like the names of people we have met or known in our own lives – did you specifically want to stay away from the more exotic, invented names that fill fantasy, and if so, why? A little, but I also was very much inspired by Middle English literature, such as The Canterbury Tales by Geoffrey Chaucer, where the written word was young and proper spelling had yet to be formalized. If you read those stories in the original prose, words and names can be spelled more than one way on the same page. In The Painted Man, mankind has lost most of its written word, and I tried to illustrate that in the bastardization of common names as people living hand to mouth forgot the proper root names and spellings over the centuries of demon oppression. Some readers of The Painted Man may see parallels between your novel and the works of other fantasy authors; for example, the warrior society that the character Jardir belongs to is very similar to two groups or cultures within Robert Jordan’s Wheel of Time series – was this intentional on your part, as a nod to Mr Jordan? You’re talking about the Aiel, I assume. I’ve been a big fan of Mr. Jordan for years, and I can’t say I wasn’t influenced by him at all, but Jardir and the Krasians are more meant to be a combination of the Greek citizen-soldiers of ancient Sparta and the warriors of Islam in the days of Mohammed, with a little Asian culture thrown in for good measure. You’ve been very lucky to get some incredible covers for both the US and UK edition of The Painted Man – how did this come about, and did you have any input in the choosing of the covers? Authors, especially new ones, don’t usually get much say in their covers. We control the insides of the book, and the publishers control the outside. That said, I did a lot of design work for my website before the books reached the cover stage, commissioning ward designs and even a portrait of Arlen to anchor the site, and I was very pleased that this work heavily influenced the end-results from my publishers. The Harper Voyager cover (UK), which will come out in your market, is meant to target the fantasy reader directly, and I agree that it is fantastic in that regard. The Del Rey (US) cover is meant to appeal to a broader scope of reader, showing their belief that people who do not normally read fantasy will enjoy the book as well, much as publishers are doing with the recent George RR Martin covers. I am very flattered and gratified by their faith in the work, and I hope it doesn’t disappoint. Is there anything from the process of writing The Painted Man that you have taken forward in your life? Any insights, lessons or realizations? I’ve learned so much about writing during the process of writing and revising this book that I can barely recognize my own prose from beforehand. It’s a constant process to improve, and there is no greater satisfaction than attempting to write something you think is beyond you and pulling it off. 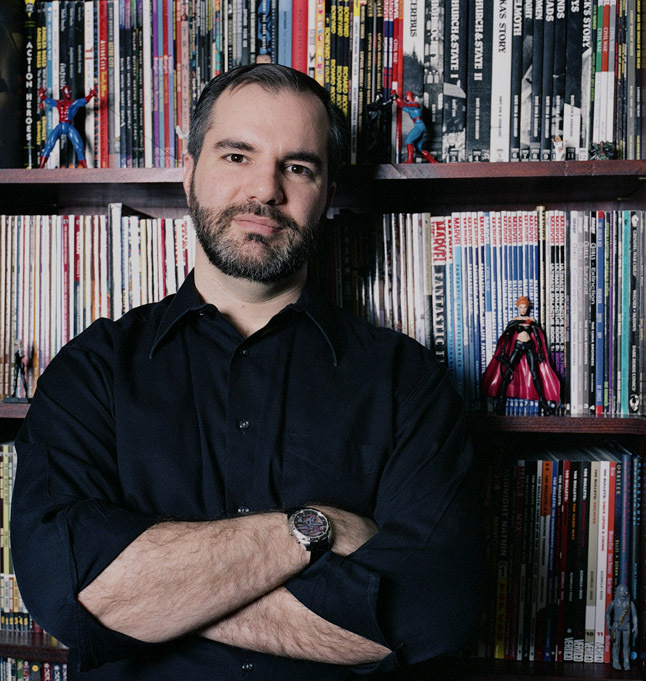 Also, considering I wrote more than half of the book with my thumbs on my smartphone while riding the New York City subway to and from work every day, I’ve learned that the best way to complete a gigantic project is to break it up into smaller bits and chip away at them whenever you have time. Really, most any big problem can be tackled that way. In South Africa, the machinery of regular conventions, as well as the practically non-existent availability of agents, hampers many aspiring authors – is there any advice that you would give to those trying to get their work published? Well, I can’t speak to the specifics of the South African market, but getting published is a difficult road under any circumstances, and it’s very easy for writers to use that as an excuse not to try as hard as they can, and to keep on trying even after they face rejection. Getting published is an exercise in stubbornness. The most famous authors in the world have rejection letters in their filing cabinets. I think it was Heinlein who said he could paper his office walls with them. Beyond that, the best advice I can give is to write every day, and constantly strive to improve your work. When your work is criticized, wait for the sting to fade, and then try to see what the critics were talking about and really challenge yourself as to whether they had a valid point. Don’t try to sell something until you honestly believe it’s as good as you can possibly make it, and when it is, don’t take rejections and setbacks personally. Everyone’s opinion is just that. My wife and I are equal partners in all things baby. Well, except for those chores dictated by biology. J I have to say, I have a new appreciation for my and other parents now. The most unexpected thing was the constant, mind-numbing fear for your child’s safety, which my mother tells me will never go away. But even so, I’ve never been happier, and I can’t wait until she’s old enough for story time. We’ll be starting with The Hobbit, of course. Lastly, you are working on The Desert Spear, Book Two in the Demon Trilogy – can you give us a taste of what we can expect from the novel? About half of The Desert Spear will chronicle the life of Jardir, the Krasian leader, from childhood to the present day, giving a new perspective on the character and his relationship to Arlen. There will also be another character from The Painted Man, Renna Tanner, who will take centre stage for a while. In addition, we’ll see some new demon breeds, along with plenty of scenes centred around Arlen, Leesha, and Rojer as they attempt to rally the people of Thesa to unite and throw off the yoke demons have put mankind under. The book is about 70% written, and will be turned in to my publishers not long after The Painted Man launches, so no worries about a long wait! Thanks for your time, and for a wonderful fantasy novel, Peter!